If there is 1 thing that I have quickly learnt as a new mother, it’s that baby stuff can be so expensive. It’s not so much the big items like the cot and the pram; once you’ve bought them you’re good to go for a few years. I’m talking about the little everyday items like clothes, nappies, and my favourite… baby wipes. I op-shop for a lot of my daughters clothes (she’s a fast grower), and I use a combination of modern cloth nappies and disposables, so I’ve managed to pinch a few pennies there. But then I had a look at the amount of baby wipes I was using and thought that there had to be a more economical solution. I was only just using plain supermarket brand fragrance free wipes, but in the early months I was using almost half a packet a day! 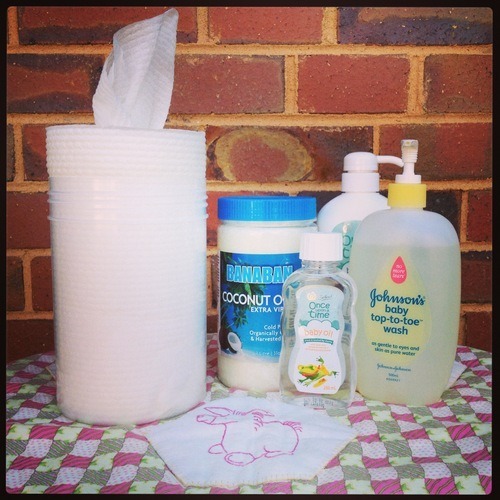 I decided to turn to Pinterest to find my solution, and I came across this great post from Hand and the Heart on making your own baby wipes with good quality paper towel. I’ve tweaked it a bit to work with my own supplies and the size of the paper towel in Australia, and I’ve found this works just as well as the factory made baby wipes. Now, it’s imperative to use high quality paper towel. I’ve tried this with cheaper recycled paper towel, and I’ve just wound up with a soggy clump of paper. I use Viva and I stock up when it’s cheap. I haven’t tried Handee Ultra, but you might get similar results. Let me know if you do! In my version of these wipes I use tea tree and lavender oils and because of that they don’t go near my daughters mouth or hands, I only use these on her lower body. I have another version of this that I use for face wipes that I’ll be posting at a later date. You don’t have to use the essential oils, they are purely optional and I use them as antiseptics and as a fragrance. If you do use any essential oils, please make sure that they are the real deal and not the stuff from the $2 shop. I buy mine from either my local florist or from the health food shop. 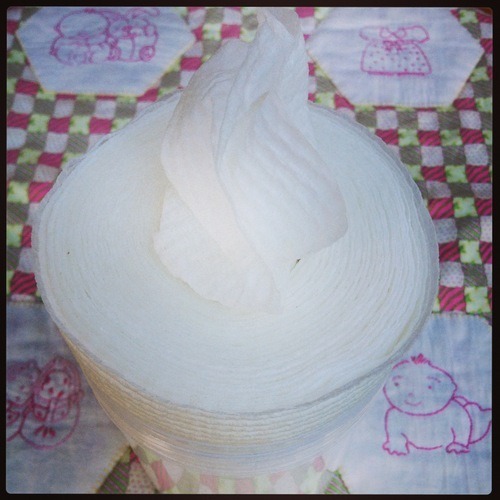 The main problem I found with the store bought wipes is that you can never pull out just one wipe; they’re just that bit too moist and they tend to clump together in bunches. Not the problem with these homemade wipes. They’re nice and thick, they separate well, and you only need one or two for a wet change! In a measuring jug, whisk together the first 6 ingredients until it looks like white shampoo. Top it up with the cooled water to the 400mL line, then whisk to combine. Place paper towel upright in container, then slowly pour half of the wipe solution over the paper towel. Allow the solution to soak in. This can take some time, I usually do this over an hour. Gradually add more solution until it’s all poured onto the paper towel. Once the paper towel has absorbed all the solution, pull out the cardboard tubing from the centre and pull out the first sheet. Place lid on container and you’re done! Notes: I got my container from Woolworths, it’s a 2Lt tall round container and it fits the roll of towel like a glove! As you can see in the pictures, the wipes stand taller than the container, but I just give them a squish down once I’ve fed the first wipe through. My hubby has also cut a hole in the lid so we can pull the wipes out easier. It’s not a pretty cut, hence no picture lol.